Wow! What a week it was! Nappy Neaman of The Elephant's Perch outdoor-sports store has seen most of Ketchum and Sun Valley's major events since first coming to the valley in 1978 with the appearance of the World Pro Skiing tour on Baldy. He's not hesitant to voice his opinions. And Neaman even suggested the headline of this account about last week's Ride Sun Valley Bike Festival and 2011 USA Cycling Mountain Bike Cross-Country National Championships, which brought more than 1,000 mountain bikers to Baldy. "Wow," Neaman said Sunday outside the Perch in downtown Ketchum while watching the hordes of two-wheeled bike enthusiasts pedaling through the sun-splashed and jam-packed resort. "Wow is the headline. The whole week was Wow!" Not only did Neaman refer to the crowds and their enthusiasm for biking, but he also tipped his hat to the USA Cycling organizers and the local committee that created a great, memorable week of racing. Some of the best mountain bike racers in the world were here. But it was a populist event that welcomed virtually everyone. 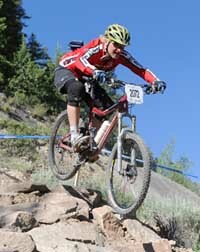 Sun Valley did a bang-up job hosting the mountain bike endurance nationals for the first time in 23 years. Racers praised the River Run venue and looked ahead to returning here next July as the resort completes the second year of its contract to stage nationals. The following is an outline of USA Cycling events by day, with a concentration on local competitors. When the results of other Ride Sun Valley Bike Festival events like Thursday's Fat Tire Criterium become available, the Express will publish them as well. Saturday was the big day for the Zions Bank Pro Men's and Women's cross-country races. And, to the surprise of virtually nobody, Georgia Gould and Todd Wells kept their Stars-and-Stripes jerseys for being national champions. Wells, 35, a rangy 6-2 cyclist from Durango, Colo., and Gould, 31, from Fort Collins, Colo., earned automatic berths on the U.S. team due to compete Aug. 31-Sept. 4 at the Union Cycliste International World Championships in Switzerland. Gould, a 2008 Olympian, took the early lead ahead of Katie Compton of Colorado Springs and clocked 1.40:14 on the five-lap, 29-kilometer course to win by 23 seconds over Vermont's Lea Davison. Winning her third overall and second straight Pro Women's XC national crown, Baltimore native Gould said, "I knew she (Lea) was not that far behind. It was really everybody individually against the hill." The top-ranked American internationally, Wells won by 49 seconds over Missoula's Sam Schultz, 26, on the six-lap Pro Men's course. It was the second straight XC national title for Wells, who in 2010 became the first man to win national titles in XC, short track XC and cyclocross in the same year. Wells said, "On a steep climb like this, at high altitude, you can't really attack. Everyone just rides at their own pace. My pace just happened to be a few seconds faster than Sam's each lap, which was enough to allow me to get away." Meanwhile, hometown heroine Rebecca Rusch, 42, competed in single speed for the first time and won the women's 22.25-kilometer race by over nine minutes with a time of 1.31:43. Specialized racer Rusch, who won Thursday's Fat Tire Criterium in downtown Ketchum, proclaimed what was special about the occasion: "Hearing my name and seeing all of my friends and training partners. It's the best week of my life living here—having nationals here. It's awesome." Biggest field of the day was in Category 1—and the Wood River Valley boasted two national Stars-and-Stripes champions. They were Brooke Hovey of Mud Honey Cycling, who captured the Women 35-39 event on the 22.25k course in 1.34:22, and 69-year-old Andy Andrews of Hailey, Men 70-plus in 57:46. Men single speed (Cat. 1/2/3): 3—Cody Peterson of Bend 1.25:13. 15—Pat Schott 1.32:42. 19—Matt Furber (2nd Cat. 3) 1.35:33 (29 finishers). Men Cat. 1 19-24: 6—Andrew Juliano of Stanley 1.26:43 (17 finishers). Men Cat. 1 25-29: 11—John Reuter 1.26:45 (21 finishers). Women Cat. 1 25-29: 3—Sara Schroeder of Hailey/Mud Honey 1.43:17. 5—Jamie Terry of Missoula 1.57:52 (5 finishers). Men Cat. 1 30-34: 9—Eric Chizum 1.25:11 (23 finishers). Men Cat. 1 40-44: 7—Eric Carlson 1.25:03. 21—Marc Driver 1.33:43 (33 finishers). Women Cat. 1 40-44: 6—Janelle Conners 1.47:47. 8—Liv Jensen 1.49:46 (11 finishers). Men Cat. 1 45-49: 15—John Tormey 1.33:24 (20 finishers). Men Cat. 1 50-54: 7—Matt Morell 1.32:43. 9—Steve Butler 1.33:32. Men Cat. 1/2/3 55-59: 21—Steve Edsall (8th Cat. 2) 2.00:17 (24 finishers). Women Cat. 1 55-59: 3—Victoria Wiseman of Mud Honey (1st Cat. 3) 1.11:54 (5 finishers). Men Cat. 1/2/3 70-plus: 2—Hans Muehlegger 57:50. The first Stars-and-Stripes jerseys of the 2011 national championships were awarded Friday after the U-23 (45 competitors) and Junior races (196 racers) on the 18-mile (29 kilometer) Baldy courses. U-23 national champions, earning berths to the UCI worlds at Switzerland, were Stephen Ettinger of Cashmere, Wash., and Jill Behlen of Boulder, Colo. Earning gold in Junior 17-18 were Howard Grotts of Durango, Colo., and AliciaRose Pastore, also of Durango. Former Sun Valley Ski Team racer Grace Alexander of Boise/BYRDS was second in Junior Women 17-18, just 69 seconds off Pastore's pace. U-23 men: DQ—Joshua Berry (Realcyclist.com). U-23 women: 7—Corinne Prevot 1.46:11 (8 finishers). Junior Women Cat. 1 17-18: 12—Maranda Stopol 1.24:40 (13 finishers). Junior Men 13-14: 32—Evan Hesselbacher (1 lap) (37 finishers). Junior Women 11-12: 3—Luma Randolph 40:05 (7 finishers). There were 106 men and 44 women in Sunday's 20-minute-plus, three-lap affair. Reigning women's champ Katie Compton of Colorado Springs, Colo., (25:09) captured her second straight STXC title. Jeremy Horgan-Kobelski of Boulder, Colo., (28:05) outsprinted Todd Wells for the men's crown. Georgia Gould of the LUNA Pro Team was third among Pro Women, 32 seconds off Compton's top pace. Only one Wood River Valley racer took part in the event, Women Cat. 1 racer Janelle Conners, who finished 16th in 22:21. Sunday's final event wrapped up a wildly successful four days of racing that featured over 1,000 fat-tire bikers taking more than 1,400 race starts. The 210-racer Super D for 168 men and 42 women was also the event that attracted the most locals, 19 in all. Gold medalist was Simone Kastner of Hailey/Mud Honey in Women 19-29 with a time of 25:05. That was 65 seconds faster than Super D silver medalist Sara Schroeder of Hailey/Mud Honey (26:10). Bronze medalists were Scott Robinson of Ketchum/SV Road & Dirt Camps (21:38) in Men 40-49 and Andrew Juliano of Stanley (22:00) in Men 19-29. Juliano won the Cat. 3 class. Ketchum's Gretchen Flint of Mud Honey (28:01) finished fifth in the Women 40-plus age class. Pro winners were Adam Craig of Bend, Ore., (19:37), his sixth Super D national title, and Lea Davison of Jericho, Vt., (23:06). Like Davison a Specialized racer, Ketchum's Rebecca Rusch placed 11th of 13 Pro Women with a final Super D time of 26:08. Craig said, "Super D is the essence of mountain biking. You have to be fit, but you still get to shred. It's the most entertaining way from the top to the bottom." Pro Men: 21—Dave Harrison 21:42. 22—Silas Hesterberg 21:44. 36—Sam Young 24:31 (38 finishers). Men 19-29: 14—Tyler Chandler 23:50 (21 finishers). Men 30-39: 7—Matthew McNeal 22:34. 10—Justin Stevenson 23:02. 16—Shea Andersen of Bend 25:11. 21—Cory Smith 31:32 (22 finishers). Men 40-49: 7—Todd Byle 23:07. 9—Chris O'Donnell 23:39. 21—Ed Binnie 26:05. 22—Caleb Baukol 28:21 (26 finishers). Men 50-plus: 8—Whiz McNeal (1st Cat. 2) 26:07. 9—Chris Kastner 26:28 (15 finishers). The USA Cycling Mountain Bike Cross-Country Nationals kicked off Thursday with Category 2/3 non-national championship races for 211 racers on the 12.5-kilometer course. Men Cat. 3 Junior 15-18 winner Garrett Gerchar, 15, of Boulder, Colo. posted the best time of the morning session in 49:23 and had this to say about the course after he finished: "It's a loose, steep and technical course, which I really like. There's a really fun, beautiful downhill. It's nice and rolling. There are not a lot of drops. You can get your speed up. The only real problem is there are a lot of really tight switchbacks." The Wood River Valley boasted three gold medalists in Ashley McQueen of Mud Honey (Cat. 2 Women 19-29 in 1.07:21), Matthew McNeal of Sun Valley Road & Dirt Camps (Cat. 2 Men 30-34 in 54:10) and Zach Latham (Cat. 3 Men 30-39 in 49:56. Men Cat. 2 19-29: 4—Jedediah Young 56:02 (15 finishers). Men Cat. 2 15-18: 28—Will Harder 1.03:47 (61 finishers). Men Cat. 2 30-34: 5—Trey Knox 58:48 (10 finishers). Men Cat. 2 45-49: 6—Herberth Corrales 1.09:08 (9 finishers). Men Cat. 2 50-54: 4—Jim Santa 1.07:07. 5—Daniel Nicholas 1.08:20. DNF—Bruce Rogers (14 finishers). Men Cat. 3 30-39: 5—Ian Sundby 1.00:59 (5 finishers).